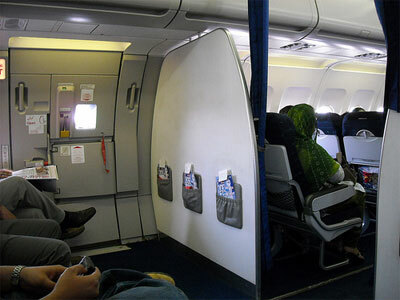 Travel Poll: Do You Prefer Bulkhead Seats? Bulkhead seats, which are the seats located directly behind the bulkhead separators, are some of the most controversial seats on planes. There can be a major difference in the bulkhead seat configuration based on which airline and aircraft you are flying on. With no seat in front of you, no one can recline into your space. This usually makes it easier to enter and exit your seat during flight too. Some bulkhead seats provide extra legroom. If the bulkhead wall is situated very far in front of the first row of seats, those sitting in the bulkhead seats will enjoy extra space. If you are on an aircraft with personal televisions, it may be stored in your seat’s armrest because there is no seat back in front of you. Having it come out of the armrest enables you to move and adjust the screen, but may reduce seat width slightly. If you are in a standard bulkhead seat the bulkhead wall will be about a foot in front of your seat, limiting the space you have to stretch your legs. Without a seat in front of you to hold a seat-back tray table, tray tables for bulkhead seats are usually stored in the seat’s armrest. This makes the armrest immovable and slightly reduces the seat’s width. If you are on an aircraft with personal televisions, it will also likely be in the armrest. If bassinet positions are offered, they are often located at the bulkheads increasing your chance of being seated in close proximity to babies. I always prefer to pick bulkhead seats if its near the window. The ones in the middle always tend to be either crampped or have people running across to reach the free lavotory.